Good morning, friends! I’m so glad you enjoyed yesterday’s post on financial wellness. It was something I’d been writing in my brain for over a year now. 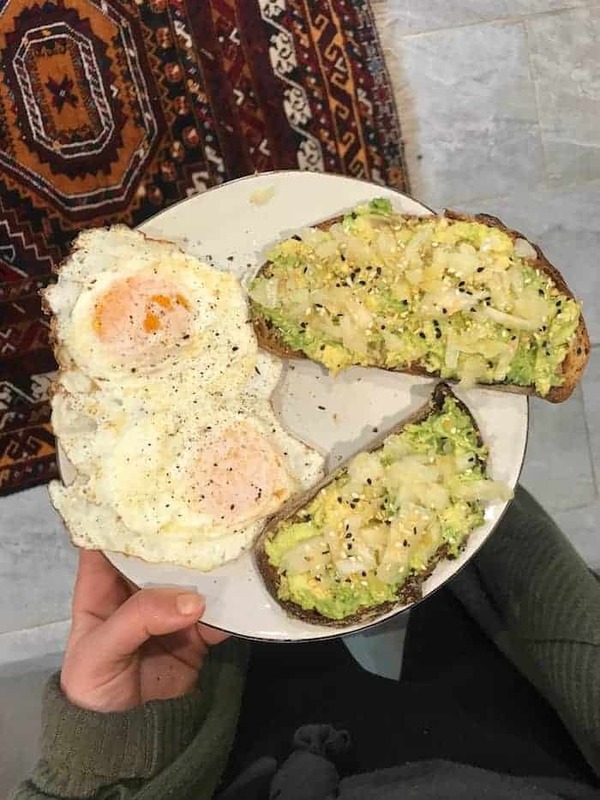 Breakfast was two pieces of heritage grain sourdough toast with avocado, caraway kraut, and everything bagel spice plus two fried pasture-raised eggs. I love that Kroger’s Simple Truth brand has pasture-raised eggs (meaning the chickens are free to wander outdoors and eat natural feed like worms and grass) for a bit more affordable than other brands. Did you know 95% of eggs come from chickens raised in cages where they can barely move? The more you can support local farmers you trust or purchase pasture-raised eggs versus factory farmed eggs at the store, the better. Even those with the “free range” label typically live in crowded cages with limited outdoor access. You can also look for the “certified humane” label on the carton. Beyond being more humane, pasture-raised eggs may be higher in omega-3 fatty acids and vitamin E. I also think they taste noticeably better! 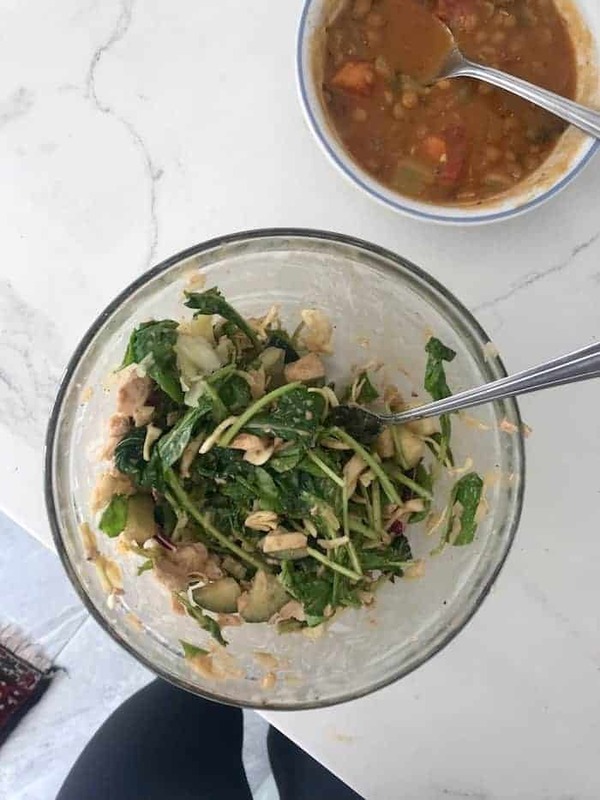 Lunch was a bowl of lentil soup and a big salad with local arugula and cabbage from our CSA, leftover Wild Planet tuna, some more kraut, diced cucumber, and the best balsamic vinaigrette which I always have ready to go in the fridge. I like to make a batch of soup each weekend to pair with toast or salad for quick lunches. 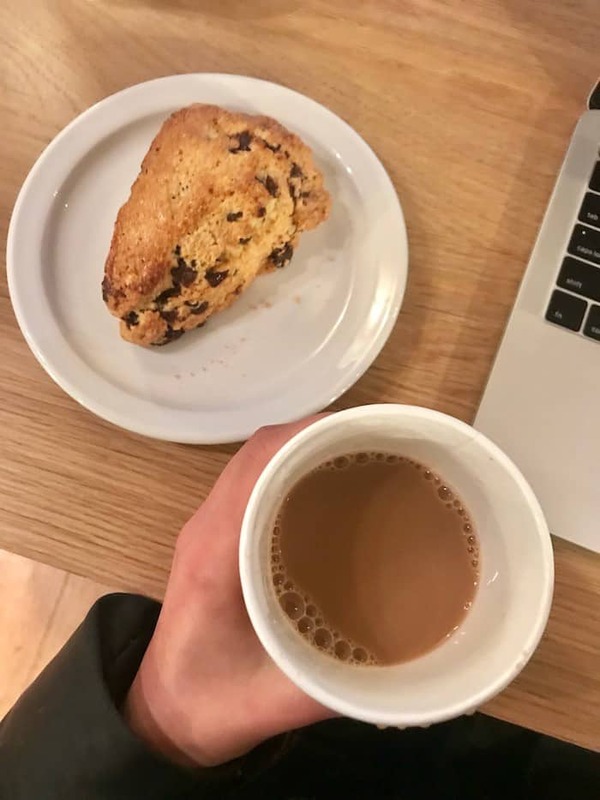 I hung out at Stauf’s in the afternoon to get some work done and munched on a chocolate chip scone with coffee. What I really wanted was their blueberry muffin because it’s the best ever but they were out so I settled on the scone, which tasted marvelous with the coffee. Old me would’ve freaked out that I didn’t have a healthy snack on hand when hunger struck. Making spontaneous food decisions is one of the most magical parts of eating intuitively. I didn’t plan that I’d get a scone at 4pm; it just sounded really good in the moment. One the most helpful things I did for myself when transitioning out of the obsessing with clean eating was not planning meals ahead of time, since what I really needed to do was relinquish control. 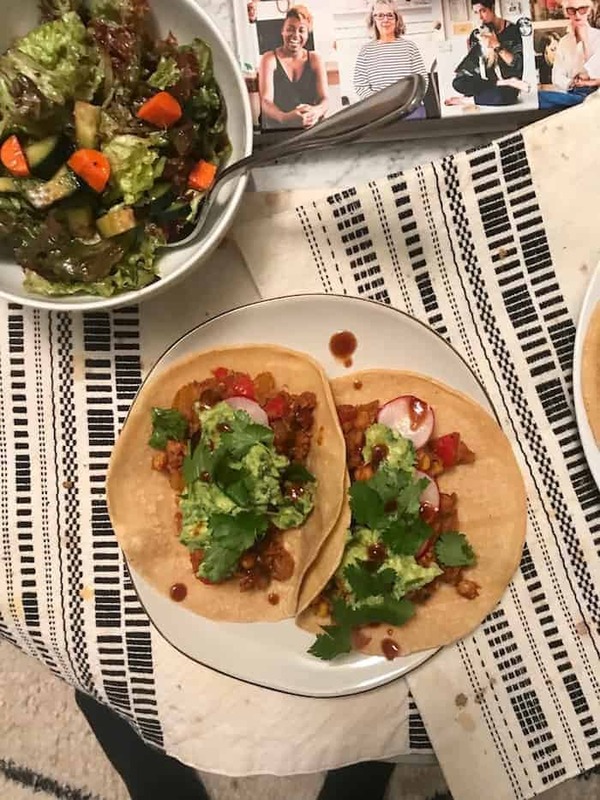 Dinner was tacos that we’ve been having once a week inspired by this recipe. In a large skillet, sauté an onion and a bell pepper in extra virgin olive oil with a pinch of kosher salt (yesterday I used a bag of frozen peppers and onions). Then add some frozen corn, a few spoonfuls of tomato paste, lots of cumin, chili powder, smoked paprika, salt, pepper, and Tabasco Chipotle hot sauce. Next add two cans of drained chickpeas and a big handful of finely chopped walnuts or pecans. I use a potato masher to mash everything together until the texture resembles taco meat. Taste and adjust for more seasoning, then stuff in soft corn tortillas with the best guac, cabbage, and salsa. My favorite salsa brands are local Frog Ranch, Ridiculously Good Salsa, and Newman’s Own (all proceeds go to charity). 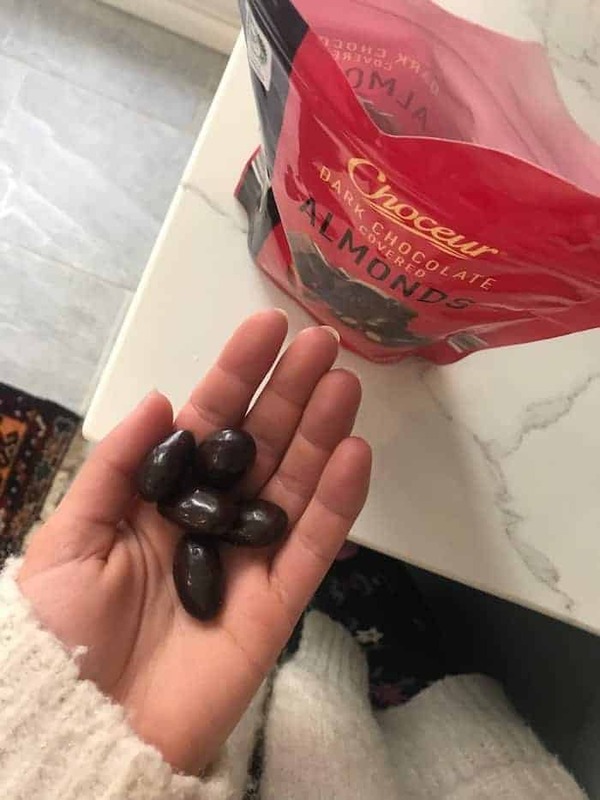 Munched on a few of ALDI’s dark chocolate covered almonds while we watched Madame Secretary. For all my local Columbus friends, we went to La Tavola Friday night for dinner and it was SO GOOD. We started with the house salad and then I ordered the gnocchi with marinara for my entrée. Tiramisu for dessert, obviously. I highly recommend it! What we THINK “cage free chickens” means and what it actually means are usually two different things, unless you are talking about a small local farm. The only way to know for sure that the chickens are treated well is to raise them yourself. I hear ya! Since most people aren’t able to raise chickens, hopefully we can point people in the right direction to the next best choice. La Tavola may be my favorite restaurant in Cbus. That house salad is really good. If they have the beet salad with fresh ricotta and pistacios it’s a must. the specials are always good and the spaghetti and meatballs is my favorite marinara in town. don’t get me started on the “belgian blitz” gelato or the lemon tart for dessert. really great service and cool vibe too. Yummmm I can’t wait to go back!! Thank you for the mention about pastured eggs. I am so passionate about this topic and the labels are misleading. Pastured eggs from smaller farms are so much more vibrant and tasty, not to mention loads more nutritious! Your breakfast toast always looks incredible, btw! I really wanted to make it to La Tavola while I lived in Columbus but unfortunately didn’t make it. Have you been to Vittoria in Powell? Their food is amazing and service is incredible! I haven’t but sounds amazing! Your balsamic dressing truly is the best! I put it on EVERYTHING! I don’t eat eggs myself but looking for the “certified humane” is very important if buying eggs at the grocery store (vs a farmers market) since there are so many confusing and unsubstantiated unmonitored marketing phrases used now for eggs (and dairy for that matter). How great that Kroger has that option for their private label eggs! No Kroger near me in nyc but i’ve read they have some fantastic store brand items that are high quality at a great value. I love using lentils and walnuts with mushrooms as a taco filling- I cook the onion/garlic first, add spices, then the mushrooms til they’re done, then just mix in cooked lentils and chopped walnuts. Such a delicious combo!